Tim Patterson was a big Rocky Horror Picture Show enthusiast, who played Rocky Horror on the “stage shows” BEFORE wrestling..
Tim Patterson made a tremendous side living at night clubs as a comic and theater actor.. While wrestling for the WWF, TV announcers took great pleasure in wondering if Tim was the son of Pat Patterson..
Tim Patterson was only reached “job” status in the WWF but was a main eventer in California and Arizona..
Tim Patterson and his manager The Time Traveler, engaged in a feud running several weeks in Phoenix in the 1980s..
~~~filling the arena in main events against Billy Anderson (Tim’s rainer) that were usually bloodbaths..
December 21, 1986 – Wrestling Challenge: Billy Jack Haynes, Hillbilly Jim & Pedro Morales defeated Buddy Ryder, Kevin Collins & Tim Patterson. December 27, 1986 – Superstars: The American Express (Danny Spivey & Mike Rotundo) defeated Moondog Spot & Tim Patterson. January 10, 1987 – Superstars: Billy Jack Haynes, George Steele & The Junkyard Dog defeated Frenchy Martin, Mike Luca & Tim Patterson. March 27, 1987 – UWF: Bill Irwin defeated Tim Patterson. May 31, 1987 – Wrestling Challenge: Ken Patera defeated Tim Patterson. June 6, 1987 – Superstars: Brutus Beefcake defeated Tim Patterson. September 5, 1987 – Superstars: The Magnificent Muraco defeated Tim Patterson. September 13, 1987 – Wrestling Challenge: Superstar Billy Graham defeated Tim Patterson. February 17, 1988 – NWA: Arn Anderson defeated Tim Patterson. May 28, 1988 – Superstars: The Junkyard Dog defeated Tim Patterson. February 11, 1989 – Superstars: Tito Santana defeated Tim Patterson. February 18, 1989 – Wrestling Challenge: The Bushwhackers (Butch & Luke) defeated The Black Knight & Tim Patterson. March 25, 1989 – Superstars: Hercules defeated Tim Patterson. March 26, 1989 – Wrestling Challenge: Brutus Beefcake defeated Tim Patterson. August 26, 1989 – Superstars: The Rockers (Marty Jannetty & Shawn Michaels) defeated The Black Knight & Tim Patterson. September 3, 1989 – Wrestling Challenge: Demolition (Ax & Smash) defeated The Intruder & Tim Patterson. July 6, 1991 – Superstars: The Rockers (Marty Jannetty & Shawn Michaels) defeated The Brooklyn Brawler & Tim Patterson. July 14, 1991 – Wrestling Challenge: Bret Hart defeated Tim Patterson. July 20, 1991 – Superstars: The Dragon defeated Tim Patterson. August 10, 1991 – Superstars: The British Bulldog defeated Tim Patterson. October 27, 1991 – House Show: Jim Neidhart defeated Tim Patterson. November 20, 1991 – FMW: Ricky Fuji & Sambo Asako defeated Mercenarios Americanos (Mercenario I & Mercenario II). November 21, 1991 – FMW: Grigory Verichev, Horace Boulder, Koba Kurtanidze & Mark Starr defeated Calypso Jim, Katsuji Ueda & Mercenarios Americanos (Mercenario I & Mercenario II). November 24, 1991 – FMW: Atsushi Onita & Tarzan Goto defeated Mercenarios Americanos (Mercenario I & Mercenario II). November 25, 1991 – FMW: Sabu & The Sheik defeated Mercenarios Americanos (Mercenario I & Mercenario II). November 26, 1991 – FMW: Calypso Jim & Katsuji Ueda defeated Mercenarios Americanos (Mercenario I & Mercenario II). November 28, 1991 – FMW: Leon Spinks & Rufus Blackborn defeated Mercenarios Americanos (Mercenario I & Mercenario II). November 29, 1991 – FMW: Leon Spinks & Rufus Blackborn defeated Mercenarios Americanos (Mercenario I & Mercenario II). November 30, 1991 – FMW: Big Titan & The Gladiator defeated Mercenarios Americanos (Mercenario I & Mercenario II). December 1, 1991 – FMW: Mercenarios Americanos (Mercenario I & Mercenario II) defeated Chong Summusu & Kim Shunki by knockout. December 2, 1991 – FMW: Mercenarios Americanos (Mercenario I & Mercenario II) defeated Amigo Ultra & El Pandita. December 5, 1991 – FMW: Mercenarios Americanos (Mercenario I & Mercenario II) defeated Eiji Ezaki & Katsuji Ueda. December 6, 1991 – FMW: Horace Boulder & Mark Starr defeated Mercenarios Americanos (Mercenario I & Mercenario II). December 7, 1991 – FMW: Grigory Verichev & Koba Kurtanidze defeated Mercenarios Americanos (Mercenario I & Mercenario II). December 8, 1991 – FMW: Leon Spinks & Rufus Blackborn defeated Mercenarios Americanos (Mercenario I & Mercenario II). December 9, 1991 – FMW: Big Titan, Horace Boulder, Mark Starr & The Gladiator defeated Chong Summusu, Kim Shunki & Mercenarios Americanos (Mercenario I & Mercenario II). May 15, 1992 – FMW: Eiji Ezaki, Rey Misterio Sr. & Ultraman 2000 defeated Mercenarios Americanos (Mercenario I, Mercenario II, Mercenario III). May 16, 1992 – FMW: Mercenarios Americanos (Mercenario I, Mercenario II & Mercenario III) defeated Eiji Ezaki, Mr. Gannosuke & Ultra Taro. August 23, 1992 – FMW: Grigory Verichev & Tarzan Goto defeated Dr. Luther & Mercenario I.
August 24, 26, 1992 – FMW: Sambo Asako & Tarzan Goto defeated Mercenarios Americanos (Mercenario I & Mercenario II). August 25, 1992 – FMW: Dr. Luther & Mercenario I defeated Amigo Ultra & Tarzan Goto. August 27, 1992 – FMW: Grigory Verichev defeated Mercenario I.
August 28, 1992 – FMW: Sambo Asako defeated Mercenario I.
August 29, 1992 – FMW: Grigory Verichev defeated Mercenario I.
August 30, 1992 – FMW: Ricky Fuji & Tarzan Goto defeated Mercenarios Americanos (Mercenario I & Mercenario II). August 31, 1992 – FMW: The Great Punk defeated Mercernario I.
September 1, 1992 – FMW: Mercenarios Americanos (Mercenario I & Mercenario II) defeated Amigo Ultra & Ricky Fuji. September 2, 1992 – FMW: Ricky Fuji defeated Mercenario I.
September 3, 1992 – FMW: Ricky Fuji & Tarzan Goto defeated Mercenarios Americanos (Mercenario I & Mercenario II). September 4, 1992 – FMW: Ricky Fuji, Tarzan Goto & The Great Punk defeated Mercenarios Americanos (Mercenario I & Mercenario II) & Sabu. September 5, 1992 – FMW: Grigory Verichev defeated Mercenario I.
September 6, 1992 – FMW: Grigory Verichev defeated Mercenario I.
October 23, 1992 – CMLL/USWA: Fabuloso Blondy, Mercenario I & Rick Patterson defeated El Texano, Gran Hamada & Silver King by disqualification. February 13, 1993 – Superstars: Bob Backlund defeated Tim Patterson in a dark match. 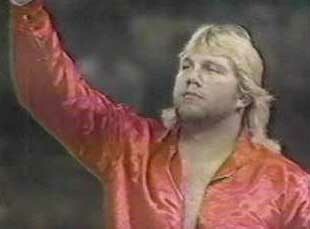 April 24, 1993 – Superstars: Jim Duggan defeated Tim Patterson. May 9, 1993 – Wrestling Challenge: Virgil defeated Tim Patterson. May 28, 1994 – MWF: Mercenarios Americanos (Mercenario I, Mercenario II & Mercenario III) defeated Cosmos, Torito & Torito Jr..
July 9, 1994 – MWF: Los Brazos (Brazo de Oro, Brazo de Plata & El Brazo) vs. Mercenarios Americanos (Mercenario I, Mercenario II, Mercenario III) ended in a double count-out. January 27, 1996 – Superstars: Hunter Hearst Helmsley defeated Tim Patterson by disqualification. February 17, 1996 – Superstars: Justin Bradshaw defeated Tim Patterson. April 6, 1996 – Superstars: Ahmed Johnson defeated Tim Patterson. April 27, 1996 – Superstars: The Bushwhackers (Butch & Luke) defeated Dave Starr & Tim Patterson. July 7, 1996 – EWF: Bobby Bradley & The Suicide Kid defeated Eddie Williams & Tim Patterson. February 19, 2000 – Jakked: Prince Albert defeated Tim Patterson. January 15, 2011 – OHW: Josh Emanuel defeated Tim Patterson.